This program has been set up to automatically produce codes for the PassTime starter interrupt devices, including PassTimePlus™ and the older Version 2 (v2). When you complete a sale, and again when you take payments, the system can produce the next code your customer will need for their PassTime device. Your system will need access to the internet for it to obtain codes for the PassTimePlus™ unit! Also, a PassTime Button will appear on the Customer Activity window. This button will display the previous code history for a customer, plus allow you to assign a code. The number of days added to the PassTime system will always be the number of days from "today" until the "Shut Down Date" plus any grace days (It's called "Make code good through date" for version 2). For older Version 2 users you can also use this option to enter a Manual code - this is a code that was generated from another computer and is used to bring your customers file up-to-date. Step By Step - Initial Setup Of PassTime (this only needs to be completed one time). Select Miscellaneous from the main gray Frazer screen. Select Option 1 – System Options. Select Tab 2 - Sales Option 2. Click on the Starter Interrupt Device Options button in the lower right corner. Check the box to "Add PassTime Starter Interrupt option to System." Enter default days for Grace Days, Emergency Days and Warning Days. (Version 2 uses only Grace Days) The system will be set to shut down at the customer's due date plus the grace days. A warning will start letting the customer know the shut down date is coming. The warning days is how many days before the shut down date the warning begins. Select the most common version of the PassTime device that you will be installing, either PassTimePlus™ or the older version 2. Check "Display Code On Special Window When Generated" if you would like a special screen to pop up after the initial sale, or after a payment is taken, that will display the new code and give you the option to print a code ticket. Select the option for "Print code on receipt" if you want the PassTime codes to print on receipts. Be sure to click both the "Return to System Options Window" and then the "Save" buttons to save your work. Step By Step - Activating PassTime for a customer at time of sale. 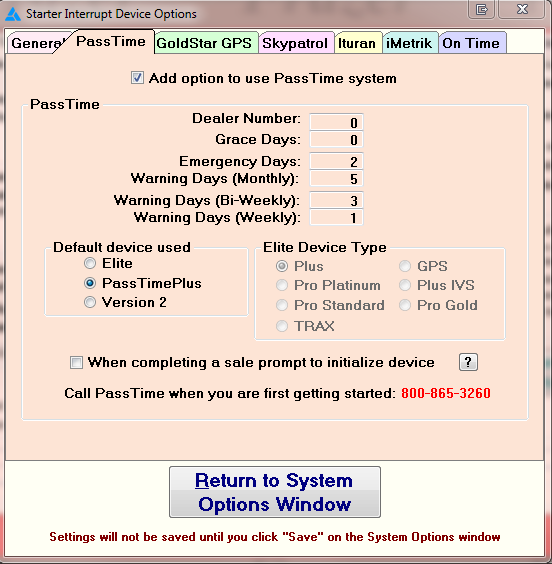 The PassTime information can be found in the lower right column on the Customer Tab on the Sales window. Click on Enter Sales BUTTON. Select PassTime in the Starter Interrupt Device Option Box in the lower right corner. Select whether you are installing a PassTimePlus unit or an older version 2 unit. You must enter the unit serial number when using a PassTimePlus unit. PassTimePlus (tm) also uses "Warning Days". The system will use whatever warning days you have entered in the System Options window. You can change the warning days from the customer activity screen. (see next section). Step By Step - Activating PassTime for a customer after the sale is complete. Click on Customer Activity BUTTON and select the customer. Click on B - Customer Processing BUTTON. Click on A - Customer Information and Costs BUTTON. Select PassTime in the Starter Interrrupt Device Box. If you are using PassTimePlus you will need to also enter the unit's serial number, and at least 1 for the emergency days and warning days.